• 1 tablespoon lemon thyme, optional. For the Carbonara sauce, put the egg yolks, cream, the juice of the two lemons and half the Parmesan into a mixing jug and mix together with a fork. Heat a large frying pan, add a splash of olive oil and fry the chicken and pancetta until golden and cooked through. Lower the heat to medium and add the leeks to the pan, and fry until they have softened slightly but still their vibrant green colour. Cook the spaghetti until it is al dente, drain it. 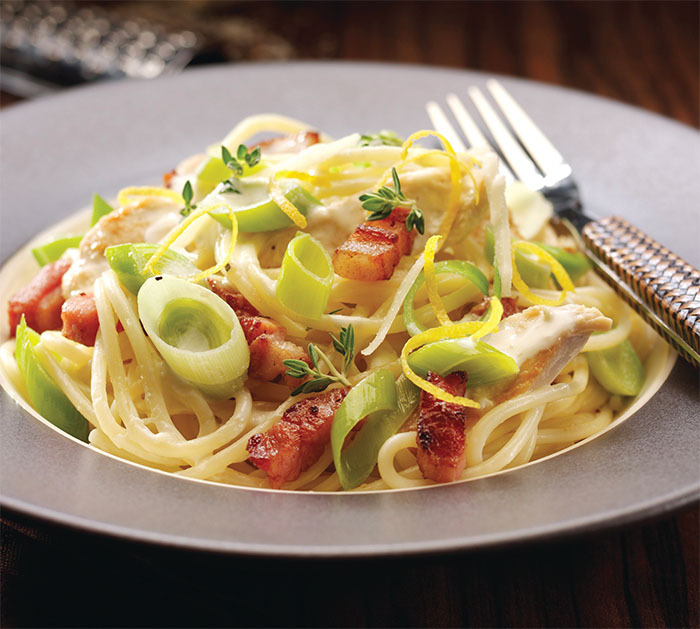 Immediately, toss the pasta in the pan with the leeks, chicken and pancetta, then remove from the heat and add 50ml of hot water and the carbonara sauce to the pasta and stir together. Season with salt and black pepper. To serve – grate the lemon peel onto the top of the pasta with the rest of the Parmesan and the lemon thyme if using.